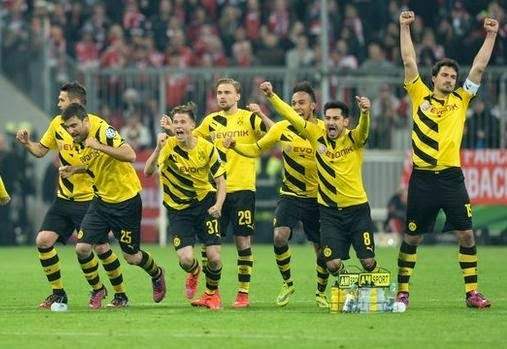 Bayern miss all four of their penalties in the shootout as Dortmund beat them in their German Cup knockout clash in Munich.Dortmund head into the DFB Pokal final, courtesy of a 2-0 penalty shootout win over Bayern! The two sides went the full way, after a 1-1 draw after extra time, but Die Roten failed to score from even one spot kick! Only Sebastian Kehl and Ilkay Gundogan scored from seven penalty-takers, with Bayern's Xabi Alonso and Philipp Lahm slipping as they took their spot-kicks.